All our Grilles and Doors are made to measure. Call us for professional advice on the ultimate ideas to maximize the potential of your home. 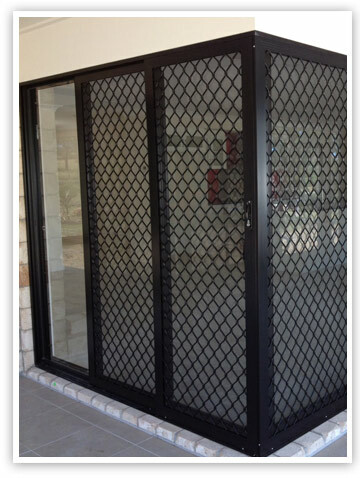 Security grilles and security doors that we install are Australian standard pop-riveted style. The security grilles and doors are a fully powder-coated product using a diamond pattern in a choice of colours. All our security screens and doors come standard with fibreglass mesh and whitco locks & barrels. Decorative Doors are the Heritage Designs using cast aluminium to add character to your home while providing the security you need. INVISI-GARD Stainless Steel Security products are constructed from Architectural Grade Aluminium & 316 Marine Grade Stainless Steel Security Mesh, both of which are corrosion resistant. The products are manufactured using the unique, patented INVISI-GARD Pressure Retention & Isolation Method. INVISI-GARD is tested and approved in accordance with Australian Standards. A range of Product options are available such as: pet flaps, assorted gauzes, triple locks, lock guards, port holes and keyed-alike barrels, etc. Ask our sales rep for personalised advice.